Perhaps I’ll be too far out of the box tomorrow when we do a beach ball relay during the children’s message. I blame it on spring fever. With the pastor forewarned, the kids will pass one beach ball up the center aisle, saying “Jesus wants you to be his disciple.” The right and left side pews will also have a ball so everyone can play along. 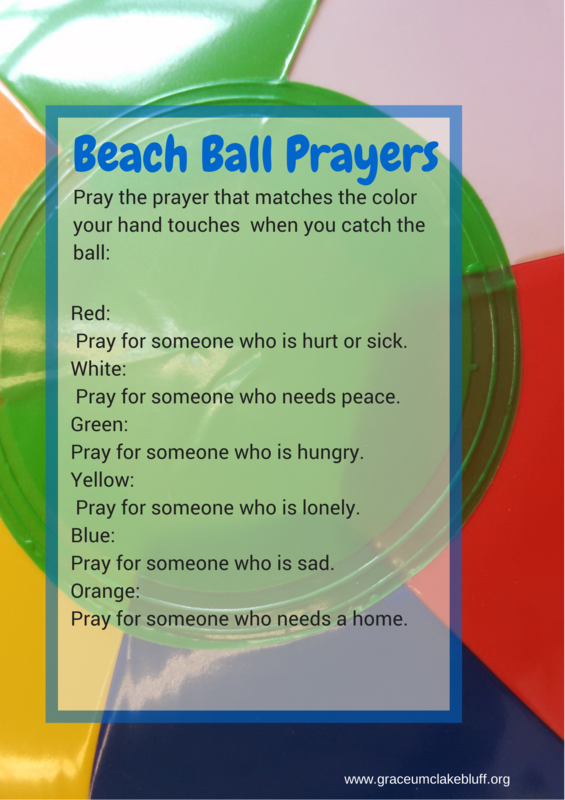 At the end, each child will receive a beach ball and this color coded prayer guide to take home to remind them that disciples pray for others. The message was inspired by Carolyn Brown’s terrific posts at Worshiping with Children. She suggested a relay baton but for our context the beach ball seems to fit better. Hopefully it will be a nod to summer. Her site is one of my top 3 go to sites for children’s ministry and her insights into the end of school year and the Acts 1:1-11 reading are spot on for this week. Sunday school classes will be making a Pentecost banner to display next week. I hope to post that project and last year’s Pentecost art piece instructions early this week. Now, off to enjoy the summer weather!